Sandy is from Germany and spent a year as a full-time volunteer, supporting people with learning disabilities to become actively involved in their community by volunteering. “Before I came to England I finished my A-levels and travelled a bit. My reasons for doing volunteering were to improve my English, but mainly to help people and change their daily routines and lives. 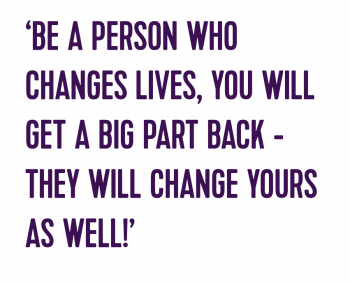 At the beginning of my volunteering I never expected that they would have changed my life as well. I lived with five other volunteers in a flat. Most of them come from Germany as well, but I also had one flat member from Italy. How flats are, we sometimes had good days and sometimes bad days. But the best part of all was my volunteering! Every day I had a different project supporting service users in their volunteering. So it wasn’t boring at all. For example, one day I volunteered in a charity shop, where my service user tagged clothes and labelled books. Another day I volunteered in a garden with a group where we planted vegetables. My favourite project was a craft group. I was there two days a week with different groups. We would draw things, stick tissue paper on plastic bottles and paper plates and other stuff. During my second half of my volunteering we got a project called ‘Tree of Life’ – it was to show that we are all connected to each other in a variety of ways. I had the opportunity to draw this tree on the walls and it was a pleasure to do that. I worked with my service users, who’ve been happy every week on a project. Sandy’s placement in the UK was made possible through the Erasmus+ Volunteering Projects funding, often referred to as EVS (European Voluntary Service). Erasmus+ Volunteering projects allow young people aged 17-30 to take part in unpaid and full-time volunteering activities for up to 12 months in another country within or outside the European Union. Sandy supported people with learning disabilities to become actively involved in their community by volunteering through our Vocal project. If Sandy’s experience has inspired you to find out more, visit the project at the link below!